Pittsburgh: Known today for the decimation of its traditional economy by globalisation, this former steel town in western Pennsylvania where the summit of G20 major economies gets under way on Thursday has a darker history that the United States would rather not be reminded of. How dark? Try inky black at mid-morning. Well before its reinvention as an eco-friendly city two decades ago, reportedly the 10th cleanest in the world, Pittsburgh was a great and foul industrial city, manufacturing steel for the United States but greenhouse gases for the rest of the world by the thousands of tonnes. The steel mills have long gone but the damage they caused to the global atmospheric commons has remained, part of the huge historical burden that the U.N. Framework Convention on Climate Change and the Kyoto Protocol had said the West had to discharge by sharply reducing its current emissions. If the rise of civilization is linked to the harmonious relationship that developed between human beings and their environment in the Indus, Nile and Mesopotamian valleys, the unrestrained emission of greenhouse gases in Pittsburgh (and places like the Ruhr valley in Europe) for more than a century is what future archaeologists of climate change are likely to identify as the beginning of our decline. Its air heavy with smoke and smog from hundreds of factories, Pittsburgh used to be once described by a local writer as “hell with the lid off”. And that was in 1860. Eighty years later, the situation had actually become worse. The local university library has an excellent archive of photographs of the city the way it was in 1940, its economic heyday. Consider the following exhibit, a street level photograph of the corner of Liberty and Fifth Avenues in downtown, not far from the David Lawrence Convention Center where world leaders will meet on September 25 to discuss the world financial crisis and the need to fight climate change. 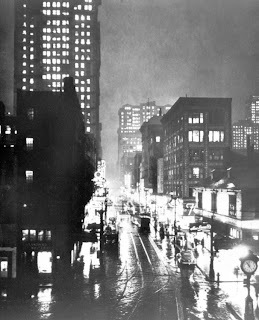 A street clock tells us the time is 10:55 a.m. but the image reminds us of night time film noir, the city’s smoky darkness punctuated by bright lights from the street and its surrounding buildings. It was only in 1941 that the first pollution control ordinances in the ‘Smoky City’ were passed but their implementation had to wait for legislation that came only at the end of World War II. Old timers speak of going out in the morning and coming back with soot on their faces. Frank Lloyd Wright was asked once what could be done about Pittsburgh. “Abandon it”, the famous architect famously replied. Since then, of course, a lot has changed. After cleaning up its skies and rivers, the city became a pioneer in ‘green building’, converting disused industrial sites, or ‘brownfields’, into eco-friendly buildings with a very low carbon footprint. The changing nature of the local economy helped, as heavy manufacturing relocated to other parts of the world. The Lawrence Convention Centre is itself a former brownfield and President Barack Obama is likely to point to it as an example of what can be done to combat global warming. India, China and other countries are resisting the idea of converting the G20 into a forum for discussing climate change when a full-fledged U.N. conference on the subject is being held in Copenhagen this December. Given Pittsburgh’s unique place in modern industrialisation, Indian and Chinese leaders need to remind their American hosts and European partners that the struggle against global warming has a past, a present as well as a future. Apart from sharply cutting current emission levels because they are still among the world’s highest — the U.S. today emits 20 tonnes per capita and the OECD average is 10 tonnes — the West must pay for what it did in the past. As for the developing countries, they too have a responsibility to cut their own emissions. But these cuts can be more easily brought about if some of the ‘green’ technology Mr. Obama showcases here is made more easily available to them. kerala blog roll with links to blogs maintained by malayali's or blogs on kerala. to your recently posted entries.